Call out the instigators. Because there’s something in the air. RIP Thunderclap. My school friend Bill Llewellyn’s dad would sometimes collect him from school. Occasionally I would cadge a lift too – it swapped the two buses from to Rumney to central Cardiff and on to Whitchurch for a shortish walk. One in May 1969, shortly before O’levels, during one of those trips “Something in the Air” by Thunderclap Newman came on the radio – it immediately grabbed my attention and has remained one of my favourite “play it louds” during the intervening years – it never fails to lift me (Wilhelmena was a great B-side). Written by Speedy Keene (died 2002) and featuring guitarist Jimmy McCulloch (died 1979) the track was produced by Pete Townshend, who also played bass under the pseudonym Bijou Drains. The final member was piano player Andy “Thunderclap” Newman – he died on March 30th. Any excuse to hear this again from the magnificent opening chords, to the handclaps over the instrumental break through to the orchestra on the final bars. Better appreciation here. I thought that during 2016 I would share more of my musical likes & (perhaps) dislikes. You can also look at The Daily Vinyl & Student Disco Tracks on Pinterest to see more of my more historical stuff. The most recent Don Henley album, Cass County, was released in September 2015. It’s very country but no less an album for that. Bought on recommendation, and I can’t recall whose, it surprised and pleased me from the opening track when I had one of those “that’s a familiar voice, I can’t quite place it” moments – it turned out to be Mick Jagger sharing the vocals with Don and Miranda Lambert. The rest of the album is excellent, great song writing and performances of an equally high standard throughout, if you enjoy the Eagles you’ll love the album especially Take a Picture of This, who knows it may even open your eyes to the good things of country music. One track, “Praying for Rain”, struck a chord with me this morning (Saturday Jan 9th 2016). I felt like I was wading through the lawn when I was walking the dogs around Rees Acres. After two months of storms and heavy rainfall the land around us is saturated. Don is singing about the opposite effects of climate change and the droughts in California. I have been listening to Rhiannon Giddens’ solo album for months and couldn’t work out why this song was so familiar. The Who – Spero ante decessero senescunt. THE WHO today confirmed that they are postponing all remaining dates on their “THE WHO HITS 50!” North American tour. They had initially postponed FOUR shows on doctors orders after Roger Daltrey contracted a mystery virus. Initially it was hoped that the rest of the tour might proceed, but after extensive tests the seriousness of his condition became apparent when doctors diagnosed Roger as having viral Meningitis and prescribed a period of rest. The band apologize to fans and realize that the postponement will cause an inconvenience for ticketholders. It wasn’t a decision taken lightly–THE WHO always give their fans 100% and were never going to compromise the show, but ultimately the band had no alternative but to postpone the tour. Is this where it all ends? I wonder. Shame to lose such a great man, he lived on a bus for large amounts of his working life, made many farewell tours and was still playing more than 100 nights a year in his late 80s. What differentiated him was his ability to make his music swing when he played – with a lot of Bluesmen (Kings Albert and Freddie) you could sit and get off on their playing but with BB you felt that you wanted to get up and dance. I saw him play on a “farewell” tour 9 years ago at the NEC – he did not disappoint. Did he ever play and sing at the same time I wonder? Two more authors of iconic riffs passed on this week. Firstly, Raphael Ravenscroft who played that saxophone riff on Gerry Rafferty’s Baker Street died last Sunday. He received a cheque for £27 which he said was bounced by the bank – he framed it and hung it the wall. Rafferty was reported to be earning £80K a year from the song at the time of his death. Today was announced the death of the wonderful Jack Bruce, was there ever a more talented musician to feature on Top of the Pops? (couldn’t find a TotP clip so here’s one from Beat Club). Here he is playing with Rory Gallagher another man who gave up his liver for rock. RIP boys, there’s a fantastic band somewhere in the great beyond. De Barra’s is a great little pub / music venue in Clonakilty. It’s hardly a place that you would think was associated with Jimi Hendrix but De Barra’s was, for many years, the haunt of the one time bass guitarist with the Jimi Hendrix Experience the late Noel Redding who lived at Ardfield. It’s a venue where all sorts of musicians love to play but it’s primarily a folk club. 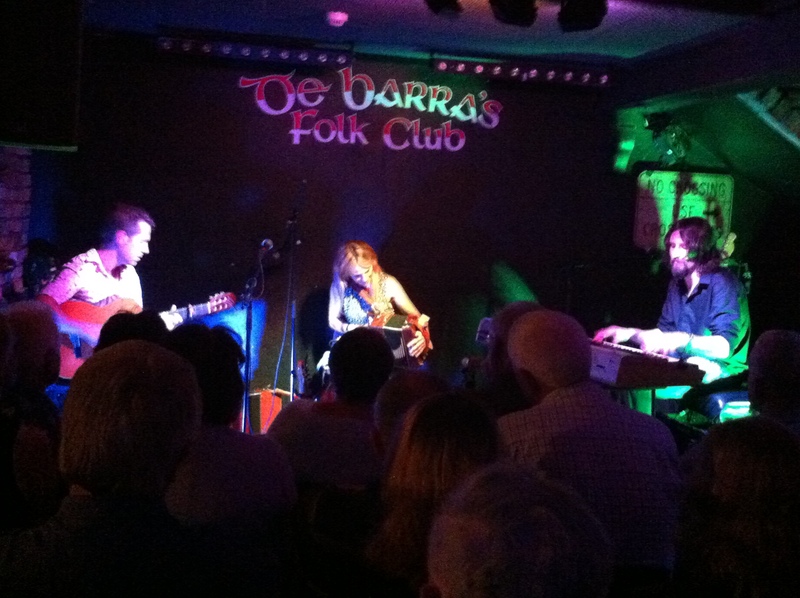 Last Friday night the Sharon Shannon trio were performing for a full house and they went down a storm. I first heard Sharon when John Peel played a couple of tracks one Saturday afternoon in 1994 during Glastonbury where she had been playing with Mike Scott & The Waterboys. I remember dancing around the soon to be demolished kitchen in our house in Gloucester with William (aged 15 months) in my arms. The trio comprised Sharon playing accordion, fiddle and tin whistle, Jim Murray – guitar and Alan Connor – bass & keyboards. Guitarist Jim Murray is local to West Cork and had a few family members and their friends in the audience to support him. One man sitting in front of us caught Jim’s eye and having used the usual mime of a hand tilting a glass and getting a nod in return went to the bar and came back with a pint of black stuff a few minutes later.